Although it is often referred to as a deck, this project served a substantially more complex set of parameters, demands and limitations. The existing deck straddled parking spaces, but provided no protection from the elements. It offered ample square footage, but failed to effectively organize its relationship to the house or landscape. From a material standpoint it lacked interest and had reached the end of its usable lifetime. building Lab was asked to resolve these shortcomings. Structural shortcomings were addressed by way of new footings, retaining walls, and steel structure. Wildland Urban Interface fire code parameters led us to resolve tensions with aesthetic concerns by using glass impregnated pine (much more attractive than p.t.!). Organization of the deck by means of split levels proved quite effective, but complicated waterproofing and finished decking details. The liquid applied waterproof membrane and palette and stand-off decking system pairs nicely and provide for easy maintenance down the road. The element that ties the project together and establishes a stronger continuity with the overall property is the slatted redwood railing. Winding around three sides of the house, the railing’s height and detailing respond to the varying relationships between use and proximities or adjacencies. The lower heights at the front of the house corresponds to movement and view. 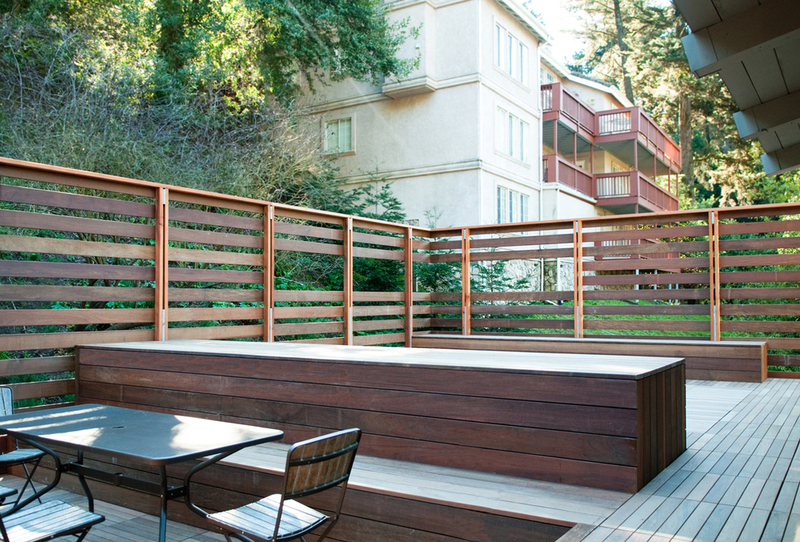 the tallest area at the ‘outdoor living room’ corner provides privacy from neighbors. At the recessed dining area, the railing once again lowers to maximize the connection to the private back yard.